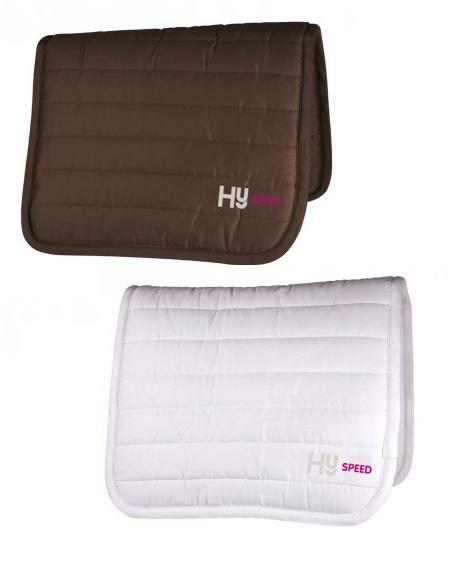 The HySPEED Reversible Comfort Pad has extra thickness for comfort. Will adapt with ease to the horse’s shape and the fit of the saddle. 3'' line pattern. Comes in one size. Below are some recent questions we've received regarding HySPEED Reversible Comfort Pad, including answers from our team. Are these pads suitable for use with treeless saddles? Yes, this saddlepad can be used with a treeless saddle. It says it comes in one size.. what size is this? pony cob horse etc? thanks! They do not give a size as Hy say that it will fit most horse and saddle sizes. The Comfort Pad is 17 inches high from the spine/middle, and approximately 38 inches from front to back.